Hightide is inspired by the imprints left on the sandy shoreline following a hightide. This timeless & versatile cushion looks beautiful with navy, grey, blues & clay tones. 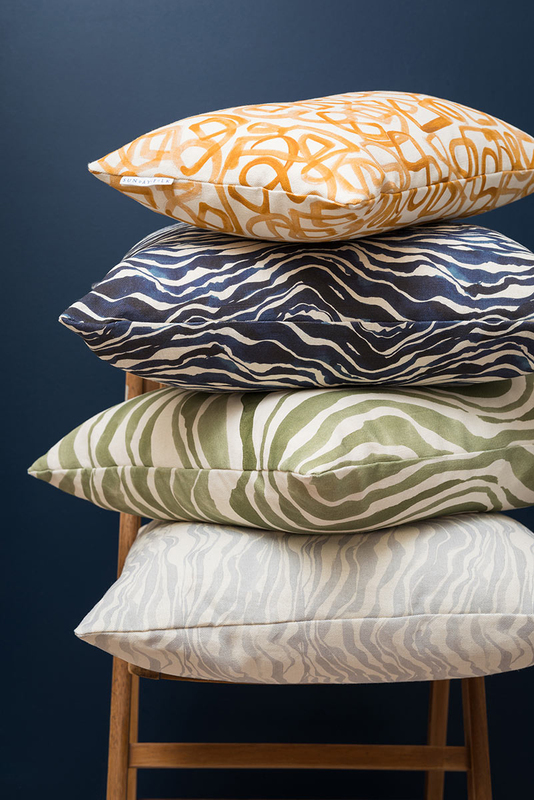 It would also work well with tribal-inspired cushions. The design is the same front & back. Please note: Surface prints may include slight irregularities due to the natural characteristics of linen. All natural fabrics will soften and fade over time, with everyday use. Care Instructions: Dry-clean using hydro carbo or hand wash individually, use quality laundry liquid/powder, wash inside out to protect print. Do not soak, wring, rub, bleach or tumble. Pull back into shape and dry flat. Warm iron on reverse side. Please note: This listing does not include an insert. Inserts can be purchased from our online store.